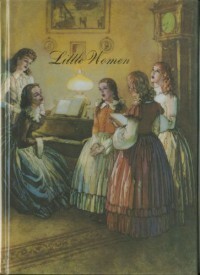 This is my third reading of Little Women and while I found more to critique as an older reader there is still no doubt in my mind that this is a treasure of a book. I’m aware that not everyone will be able to get on board with the persistent moralizing and pervasive Christian slant. (I was completely oblivious to that kind of thing as a young reader). So, in this way it reminded me a great deal of Alcott’s Old Fashioned Girl – in that you never quite forget that you’re being taught a lesson. Because of this I have yet to get completely lost in an Alcott narrative (which is why I can’t give this the full 5 stars). But what makes Little Women infinitely more satisfying than Old Fashioned Girl is the vastly superior characterization of the four principle characters – Meg, Jo, Beth and Amy. I think most readers relate to clever, awkward Jo - who is quite clearly meant to represent Alcott herself and is the unofficial ‘star’ of the story. But there is something in each girl which rings true – pretty and proper Meg, sensitive and fragile Beth, vain and spoiled Amy. The novel follows as each has their own journey of self discovery and personal growth. It’s probably not too surprising that in this reading I found myself relating most to Meg with her domestic and marital adventures. But that’s the beauty of this book – if you give it a chance you can get something new with each reading. While so many things in this novel strike me as dreadfully old fashioned and even a little irritating; so many more things are strikingly forward thinking and endearing – that a love match is preferable to a financially advantageous one, that women are strong in spirit and mind, and that they deserve educational and career opportunities beyond the traditionally prescribed roles. But for me this is primarily a book about the importance of family. Despite my chafing at the constant sermonizing I must admit this is one message I don’t mind hearing preached. With out a doubt Marmee and Mr. March are impossibly perfect parents, but they present a powerful argument for ‘nurture’ - that thoughtful and loving parenting is one of the most important factors in shaping character. And I must admit it’s refreshing to encounter fictional parents who are not evil, dead or divorced. Certainly stories of children overcoming odds are interesting, but isn’t it nice to hear about children who succeed *because* of their parents not just in spite of them?